On Monday, January 7, 2019 St. George Cathedral, Coral Gables, Florida, was blessed with a visit from our chief shepherd, His Eminence Metropolitan JOSEPH, as well as Mr. Fawaz El Khoury and Mr. Salim Abboud, Vice Chairman and CFO of the Antiochian Orthodox Christian Archdiocese, respectively. Through the guidance and leadership of His Eminence Metropolitan JOSEPH, the Cathedral Counsel was informed of his decision to transfer The Very Rev. 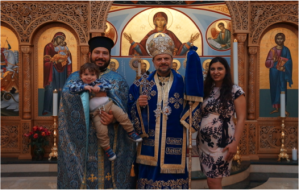 Fouad Saba to St. George Antiochian Orthodox Church in Cicero, Illinois, effective February 1, 2019. The Cathedral is grateful to have been blessed with Fr. Saba’s fruitful ministry these past seven years. The love, support, and dedication of Fr. Saba, our sister Kh. Diana, and children Katherine and Mousa, are embedded in the hearts of all the Miami community. They will always hold a special place in the lives of those who were fortunate to know them. A Tribute Banquet honouring Fr. Saba, Kh. Diana, Katherine, and Mousa was held on January 26, 2019. An outpouring of love was expressed by the entire Tribute Committee, and by all who spoke on the positive impact this amazing family has had on our community. Our beloved chief shepherd His Eminence Metropolitan JOSEPH continues to bless St. George Cathedral with love and wisdom and the Cathedral is very thankful to His Eminence for providing the Cathedral with another young, energetic, and multilingual priest, Fr. Joseph-Héctor Abouid. Father Joseph comes from St. George Church in El Paso, Texas with his lovely wife Kh. Carol and son, Aidan Emmanuel. They are expecting their second child this spring. Father Joseph-Héctor Abouid was born in 1986 in the City of Perth Amboy, New Jersey, to parents who originated from the small town of Beit-Jala, Palestine (Issa and Lidia Abouid). Father's family moved to the Central American country of Honduras, where he grew up in the city of San Pedro Sula, serving the altar of the Antiochian Orthodox Church, St. John the Baptist, aiding The Very Rev. Bulos E. Moussa (currently serving St. John Antiochian Orthodox Church in Levittown, NY). At the age of 18 and without knowing one word of Arabic, he was sent by His Eminence Metropolitan ANTONIOS (Chedraoui), Metropolitan of Mexico, Central America, Venezuela, and the Caribbean Islands, to study Theology at University of Balamand in Lebanon. There he completed Arabic studies, his Bachelors of Theology, and his Masters in Theology. Father Joseph was ordained a deacon in 2013 and in 2014, Father and Kh. Carol moved to Honduras where he served his parish for one year. In 2015, Father and Kh. Carol were assigned to the parish of St. George Antiochian Orthodox Church in Cicero, Illinois. Father Joseph was ordained to the holy priesthood on Sunday, June 12, 2016. In 2017, Fr. 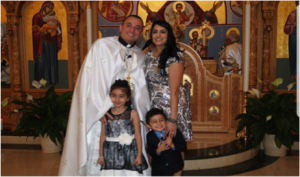 Joseph was assigned as head pastor of St. George Antiochian Orthodox Church in El Paso, Texas. The Miami community is excited to welcome and embrace Fr. Joseph as the new Dean of the Cathedral, and we look forward to continued growth under his spiritual leadership and his vision for the future. His Grace Bishop NICHOLAS of the Diocese of Miami and the Southeast welcomed and installed Fr. Joseph as Cathedral Dean on Sunday, February 3, 2019 at the Hierarchical Divine Liturgy. A celebratory luncheon and program followed as each of the Cathedral’s organizations presented Fr. Joseph, Kh. Carol and Aidan with gifts of love and welcome.